Posted on Monday, November 10th, 2014 at 10:16 am. This is the second in a series of posts from Dr Rainer Simon, one the recipients of the DM2E Open Humanities Awards – Open track. About a week ago, on Friday October 31, we held our first annotation workshop for the SEA CHANGE project. As you may recall, SEA CHANGE will hold two such workshops. The workshop participants assemble in an informal setting to mark up geographical references in ancient texts and maps, and explore further how this data can deepen our understanding of these documents. The Heidelberg University Institute of Geography has kindly agreed to be our host for this first event. A big thank you goes to Lukas Loos for setting up our visit and taking care of local organization, and to Armin Volkmann for his spontaneous decision to merge his geo-archaeology seminar with our workshop on that day. Morning Session – Let’s Annotate! Recogito includes a range of relevant geographical documents from the Classical Latin and European Medieval Period, and participants were free to choose which ones they wanted to work on. People worked on 51 different documents: 19 text documents (8 out of which in Latin language! ), and 32 map scans. identifications in text, 2.500 place name identifications on maps, 830 map transcriptions, 140 gazetteer resolutions and about 490 other actions, such as corrections, deletions or comments. 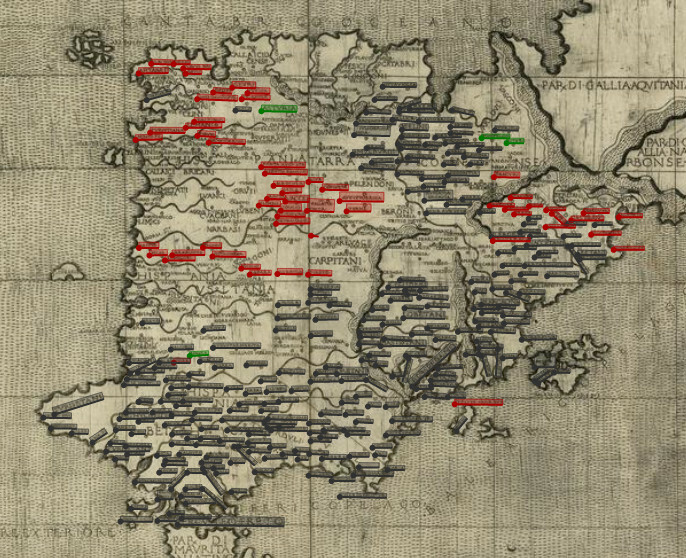 A well-tagged map of 15th Century Spain. Red tags indicate place names that still need transcribing. It was interesting for us to get such clear numbers with regard to the different types of contributions. On the one hand, these reflect how different phases of the annotation workflow are more or less time consuming. E.g. tagging a place name in a text is usually a matter of a double click, whereas on a map it takes a while to navigate the image and select the area (selecting is a process that involves a mouse click, drag, and another click). Hence the roughly equal number of name identifications in texts and maps, despite the fact that more people were working on maps. Transcribing, obviously, takes even more time, as does gazetteer resolution. With regard to gazetteer resolution, we’re currently in the process of completely re-designing the user interface for this. We should have the new interface ready by the time of the next workshop. It will be interesting to see whether this will have an impact on our numbers. Needless to say that this was, so far, the most active day we (and our Recogito server) has ever seen, almost tripling our previous daily record of September 15, with 2.312 contributions. We’re excited! Afternoon Session – Let’s Explore! In the afternoon session, Leif walked the audience through a brief tutorial on how to download data from Recogito and analyse it further in QGIS, an open source Geographical Information System. Not long after that, our participants were deeply engaged in exploring Medieval travel documents such as the Bordeaux Itinerary, matching e.g. the rate of stops and their different types against a 3D terrain model, and pondering about the time taken – and the hardships endured – by travellers in the 4th century AD during their journeys. 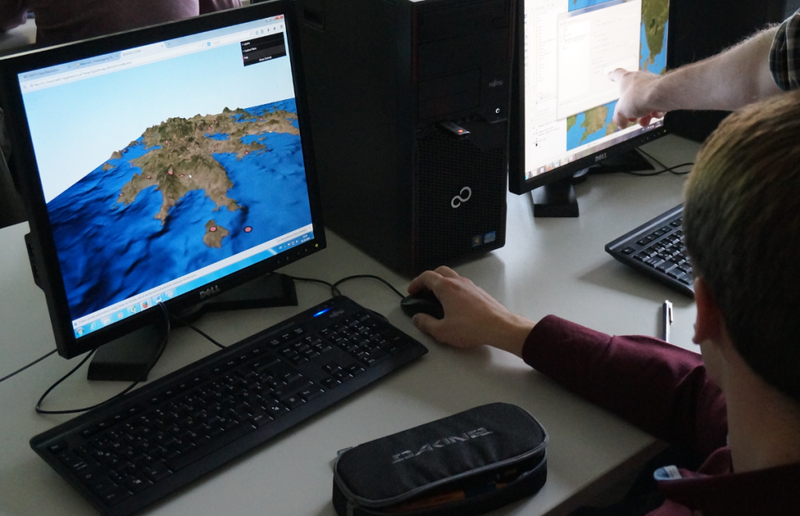 Participants exploring their data embedded in a 3D terrain model. We would like to say a big Thank You! to everyone who was there, and made this such a big success. In case you were not there, though: don’t worry, there are still ways you can participate. First, you can – as always – download all our data right from Recogito. Don’t be a stranger! No registration required. Grab our annotations. They are CC0 licensed, and packaged as CSV tables (the most straightforward data format when it comes to re-use, we think). Go ahead, experiment, and if you come up with something cool – be sure to let us know! Second, our next workshop is already scheduled. Our host this time will be Kai-Christian Bruhn from the University of Applied Sciences Mainz, and the date will be Thursday, December 4. In case you’re in the area, don’t hesitate to get in touch with us and we can still book you a seat. Last but not least: although annotating is, of course, much more fun when done together, you can also join our growing crowd of Recogito contributors online. Check our Beginner’s Tutorial. Drop us a line. We’re looking forward to hearing from you.